Beautiful made in Occuppied Japan console set. 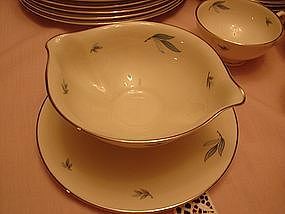 Set includesd bowl. 11 1/2 inches long. 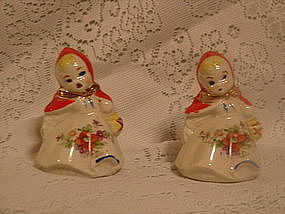 Two candle holders 6 inches tall. Beautiful applied roses with gold trim. One rose has a small chip barely noticecable and can be turned to the back for displaying. Rare to find three big pieces of occupied Japan that match for sell. 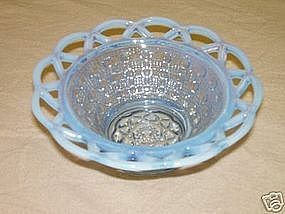 Imperial Katy Blue depression glass bowl in the sugar cane pattern. six inch dia, and two inch high tall. Made in the 1930's by Imperial glass company. Three bowls available. Mint condition. 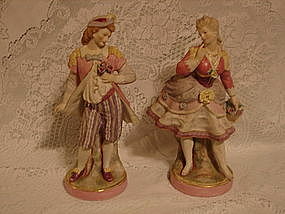 Beautiful Sitzendorf Voight Figurine pair. Large 11 inches tall. 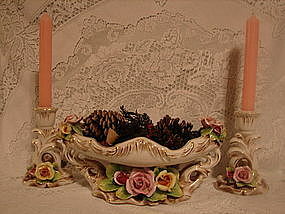 Beautiful Meissen style and quality. One tiny flower chipped on ladies basket otherwise mint. 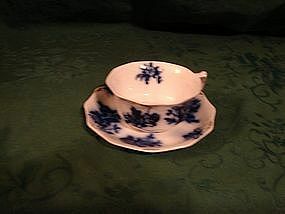 Fine German porceline. 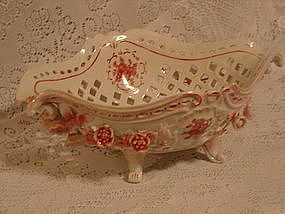 Sitzendorf Voight Bros. pierced porceline console bowl. Beautiful pink roses. Aprox. 12 inches long and 8 inches wide. Mint condition with not a chip one to any part of it not even the roses. No crazing that I can find. Museum quality piece. From the backstamp probably dates back to pre- WWI. 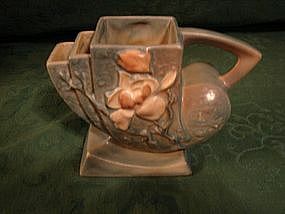 A true find for any fine porceline collector. Imperial Katy Blue sugar cane depression dishes. 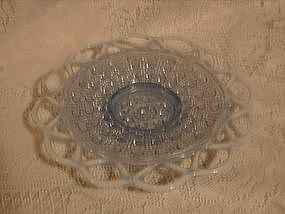 Beautiful Imperial Katy Blue 7 1/2 inch desert or salad plates. Made in the 1930's by Imperial glass company. Beautiful depression pieces with a open lace design on the edge. Sugar cane is the pattern. These pieces are getting to be quite rare. Discount of $5.00 per plate if all eight are purchased at the same time. 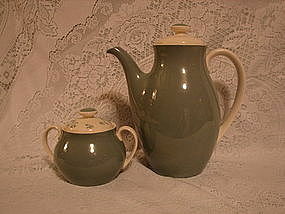 Royal Doulton teapot and matching creamer. Salesman sample displayed in a closed jewelry store. Teapot is eight inches tall. In never been used condition with very minor crazing on the lids only. Marked Royal Doulton backstamp made in England. Pattern and age unknown. Seems to be a aqua color. Very nice. Royal Copenhagen 1971 Christmas Hare Plate. 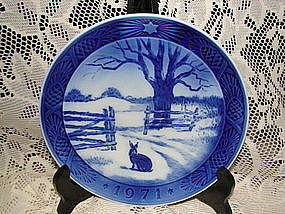 7 1/4" plate with winter scene and hare. Marked with the Royal Copenhagen mark, Hare I, Vinterlandskab, hare in winter. Mint Condition. 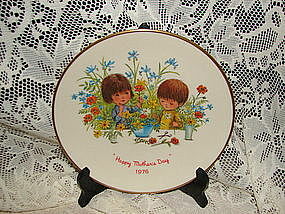 Moppets 1976 Mothers day Plate by Gorham. 8 1/4" plate fourth of a limited edition. Made in USA. Mint Condition. 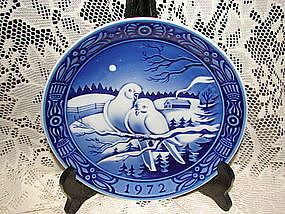 George Jensen First Issue 1972 Christmas Plate. 7 /14" plate depicting two doves. Marked George Jensen First issue. Made in Denmark. Mint in box. 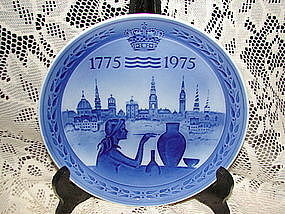 Royal Copenhagen Bicentenary collectors plate. 1775-1975. 7" plate depicting Denmark scened and lady with royal crown. Marked with Royal Copenhagen back stamp 200 ARS jubilaeum. Mint condition in box. 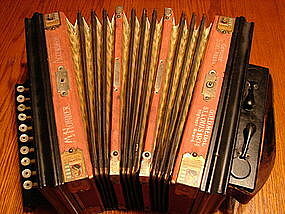 Hohner 1904 Steel reed Accordion. Wonderful 1904 steel reed Hohner squeeze box accordion. Leather straps need replacing, but otherwise in excellent condition. Plays well also. Nice old German piece with tin lithographs of M. Hohner. 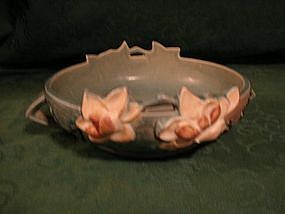 Roseville Blue Magnolia bowl. 8 3/4 inch round x 3 1/2 inch tall. Marked Roseville USA 448-8". Beautiful authentic Roseville. This is not a repro. This piece is in mint condition. 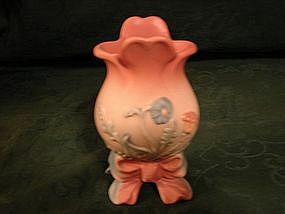 Vintage Roseville blue magnolia vase. 7 inches tall x 5 inches round. Marked Roseville USA 179-7". Mint condition with no crazing. Beautiful piece. 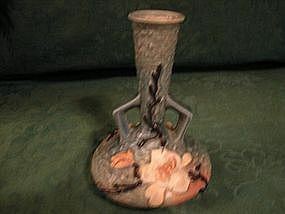 Vintage Roseville blue Magnolia art deco vase. 5 inches tall x 7 inches wide x 3 inches deep. Marked Roseville USA 182-5". This piece doesn't even have any noticeable crazing. A real rare piece in excellent condition.